Worship: A Symphony for the Senses is a three-volume series that presents Christian worship as an encounter to be experienced by the entire person — heart, mind, and all the senses. 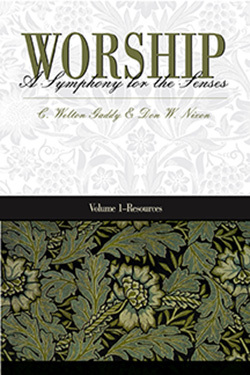 Volume 1 - Resources is a revision of the popular Worship Resources for Christian Congregations: A Symphony for the Senses (1995), with new materials and additional suggestions, including films and videos. Donald W. Nixon is Minister of the Arts of Willow Meadows Baptist Church in Houston, Texas. He lectures on the visual arts in worship and serves as a creative consultant in floral artistry.